The team at Golden Frog launched VyprVPN in 2009 and has been providing online privacy to users around the world ever since. You will find that VyprVPN has some premium features like their proprietary Chameleon technology and VyprDNS that help the service stand out as one of the leading providers in the VPN space. Let’s take a closer look, first at the service and then at their custom client software and mobile apps. The Golden Frog team offers two tiers of the VyprVPN service. They both include unlimited VPN access. The difference comes down to the number of simultaneous connections allowed and whether or not you have access to VyprVPN Cloud and Chameleon protocol. I recommend the VyprVPN Premium plan to those in countries where the government attempts to block VPNs. Both the standard VyprVPN and Premium plans are great values. As you can see VyprVPN is priced based on the billing term. A big thanks to the VyprVPN team for offering our visitors 25% off a year of VPN service, in addition to the regular term savings on annual plans. That means you can save over 60% off a year of VyprVPN Premium. Golden Frog offers a 30 day money back guarantee so regardless of which term is chosen you will have plenty of time to test their service. You can see the differences between the plans listed above. For my money the VyprVPN plan is the best value. It provides everything I need including unlimited data usage, three simultaneous connections, and NAT firewall protection. Signing up for VyprVPN is an easy process. You simply select their VyprVPN or Premium plan and then choose a monthly or annual term. Once again the annual term will save you over 60% off the regular monthly price. You can sign up for VPN using a number of payment methods. VyprVPN supports PayPal and credit card (Visa, MasterCard, American Express, Discover, etc.). They do not currently accept Bitcoin payments. The Golden Frog team understands that you need time to test the service before paying for a subscription. They offer new users a 30 day money back guarantee to help you test their network and software. The risk-free trial period includes unlimited access. Connect to any of their servers around the world. The 30 day refund period applies to all new members regardless of whether you sign up for a the standard or Premium account. Tier-1 network – VyprVPN has full control over their hardware and the code used in their client software. VyprVPN server – create your own VPN server anywhere in the world. Chameleon – helps prevent DPI, VPN blocking and throttling. VyprDNS – zero logging DNS managed by Golden Frog. VPN clients – custom software for Windows, Mac, iOS, and Android. Europe: Austria, Belgium, Bulgaria, Czech Republic, Denmark, Finland, France, Germany, Greece, Iceland, Ireland, Italy, Latvia, Liechtenstein, Lithuania, Luxembourg, Netherlands, Norway, Poland, Portugal, Romania, Russia, Slovakia, Slovenia, Spain, Sweden, Switzerland, Turkey, Ukraine, United Kingdom. Asia: Hong Kong, India, Indonesia, Japan, Macau, Malaysia, Maldives, Pakistan, Philippines, Singapore, South Korea, Taiwan, Thailand, Vietnam. Middle East – Bahrain, Israel, Qatar, Saudi Arabia, U.A.E. VyprVPN supports multiple VPN protocols. This helps you connect to the service across a wide range of devices. They support 256-bit OpenVPN, 256-bit L2TP/IPSec, and 128-bit PPTP connections. They have also developed Chameleon technology to help prevent DPI, VPN blocking and throttling. VyprVPN has custom software for Windows and Mac along with mobile apps for iOS and Android. They also have set up guides for routers. Golden Frog is very clear about what information they log and for how long. The log the user’s source IP address, VyprVPN IP address used by the user, connection start and stop time, and total number of bytes used. The logs are kept for 30 days. The Golden Frog support team supports VyprVPN and Cyphr. We have always found their support staff to be responsive and knowledgeable. The VyprVPN website has a support page with setup instructions and FAQ’s that provide answers to the most common questions. The Golden Frog team manages a large network of VPN servers in countries around the world including server locations in all seven continents. You can see our speed test results below. VyprVPN offers a 3 day fee trial which gives new users plenty of time to test their network. VyprVPN US speed test – after connecting to a VPN server in Washington, DC using the Windows client we tested our Internet speed and found it to be 57.40 Mbps download and 3.92 Mbps upstream. HideIPVPN UK speed test – after connecting to a VPN server in London via the Windows client we tested our Internet speed again and found it to be 37.17 Mbps download and 3.91 Mbps upstream. VPN Protocol – select between OpenVPN (default), L2TP/IPSec, PPTP, or their custom Chameleon protocol. Kill Switch – stop your Internet traffic anytime VyprVPN is disconnected. Connect on Untrusted Wi-Fi – automatically connect to VyprVPN anytime you use an untrusted Wi-Fi network. VyprDNS – I suggest leaving this option enabled to run your DNS queries through their zero-log DNS. VyprVPN offers several extra features that add to their VPN service. We’d like to end with some tips to help you select the best server location and protocol for different situations. 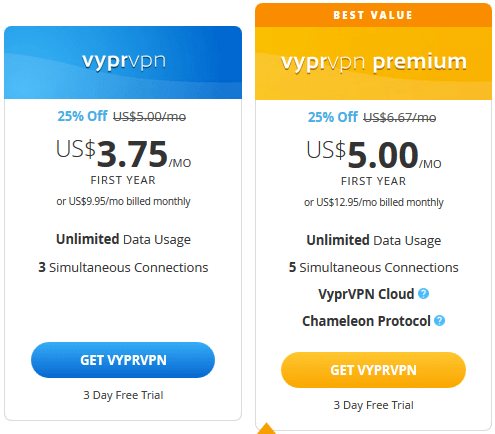 Secure your internet connection – if your primary goal is to secure your data and increase your online privacy then I suggest you connect using the OpenVPN (or Chameleon from countries like China) protocol. For the best performance you will want to connect to a nearby server. Unblock geo-blocked sites like Netflix – if your primary goal is to unblock popular online streaming sites like Netflix, Hulu and HBO Now then you can connect using PPTP which is compatible with most devices. Most of the popular media sites are in the US. In the case of Netflix you can connect to a server in another country if you want to view content from that region. For BBC iPlayer and other British channels select a server in the UK. The same is true for channels in other regions. Watch live sporting events – this is one of my favorites. VPNs are a good choice for watching live sporting events like the World Cup, Olympics, ICC Cricket, Super Bowl, and Grand Prix circuit. Connect to a VPN server in the region in which you’d like to watch coverage of the event. Don’t forget the extras – part of the benefit of using VyprVPN is the extra features. I suggest using their VyprDNS and NAT firewall features. VyprVPN is on the premium side of the VPN market. While the price is higher than some other VPNs, sometimes you get what you pay for. VyprVPN members have access to over 700 servers in countries around the world. You can connect using their custom apps for Windows, Mac, iOS, and Android. The Golden Frog team also has setup instructions for DD-WRT routers. You can use your router to protect the privacy of your entire home network with a single VyprVPN account. Best of all since VyprVPN is a tier-1 provider their network can handle the traffic without any issues. When deciding on which VyprVPN account to select I would recommend you consider the supported protocols and number of connections offered with each plan. I recommend the Premium plan to those who live in China or plan to travel there. For my money their standard VyprVPN plan is an excellent choice. You have unlimited data usage, NAT firewall protection, and three simultaneous VPN connections. You can save up to 25% off either by signing up for a year of access. The 30 day money back guarantee will give you plenty of time to test their network and custom client software.